A group of Irish bar owners held a press conference in New York on Sunday complaining about Mayor Bloomberg's Irish remarks, first reported here. I think it is time to give it a rest lads. I was the only journalist present when Bloomberg made his remarks. I think we have made our point. Bloomberg has apologized and no doubt learned his lesson. That should really be enough. 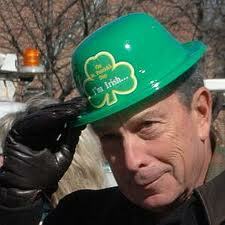 And another thing, he has been the best mayor for the Irish in a very long time on many issues. He is the most prominent politician in America supporting comprehensive immigration reform which might afford our undocumented some day to become legal. Through his business, Bloomberg News, he has invested in both the Northern Ireland economy and the Republic of Ireland economy, badly needed at this stage. He has made many trips to Ireland to helped kick start investment, and has provided valuable advice for many Irish business owners. He supports the rights of marginalized Irish groups to march in the St.Patrick's Day parade and has marched in the alternative Queens one every year. His administration has been immediately responsive on Irish issues such as the peace process when help was needed. I don't think we can expect much more. He screwed up, he apologized, time to move on. Let's not use this incident any more for cheap publicity stunts. We and he are better than that.